The dictum “all politics are local” was coined by former Speaker of the United States House of Representatives Tip O’Neill to emphasise that politics, at its core, is about engaging and solving the mundane concerns of citizens. Subsidiarity, meanwhile, is a principle of social organisation that holds that social and political issues should be dealt with at the most immediate (or local) level that’s consistent with their resolution. It’s presently best known as a general principle of European Union law. If problems should be solved at the local level, and all politics are local, then the people solving your local problems should be local politicians. In other words, the best way for governments to address their citizens’ problems is via local democracy: citizens should elect the local representatives who are responsible for solving their local mundane problems. For Malaysians, however, local democracy has not existed since the abrupt suspension of local elections in 1965. Has this been for better or for worse? The earliest local council elections in Malaysia were held on 5 and 20 December 1857 in Georgetown, Penang, and Fort of Malacca. These local elections were imperfect from any modern perspective. They had a limited franchise—voters had to own properties and were required to pay an annual assessment rate of 25 rupees—and high barriers of entry for candidates . However, it would be a mistake to judge these local elections by who it excluded rather than what it symbolised. The principles of having elected representatives in the local decision-making process, and ensuring that local councils have an elected majority, were enshrined in these elections, which predated Malaya’s independence by almost exactly 100 years. Unfortunately, these elections were abolished in 1913 . There are no clear reasons for the abolishment of these elections, but the probable explanation lies in how the drastic increase in immigration transformed municipal centres. By the early 1900s, the majority of the population in urban areas comprised immigrants from Indonesia, China, and India, but the British did not want to enfranchise them. Yet they could hardly have representative local elections if the vast majority of residents were not enfranchised. Better, then, to simply and quietly do away with elected council. The introduction of the modern type of democratic election, based on adult suffrage, has been made more carefully. It starts with local government and will, in due course, work outward and upward to Settlement, State, and Federal Councils. The transition from bureaucratic Local Government to a popularly elected Municipal Council has among its by-products the popularising of the idea of registration, the training of registration and polling staff, and the holding of the first democratic elections in the Federation of Malaya . The Kuala Lumpur Municipal Elections in 1952 played a crucial factor in establishing the Alliance—the political coalition which negotiated the transition of power from British rule to independence. The origins of the Alliance could be traced from the hastily established political cooperation set up by the Selangor state branch of the Malayan Chinese Association (MCA) and the Kuala Lumpur branch of the United Malays National Organization (UMNO) during 1952. The informal “alliance” was initially formed to combat the threat posed by the multi-ethnic Independence of Malaya Party (IMP) led by Dato’ Onn Jaafar. It proved successful when it captured nine out of 12 municipal seats in the Kuala Lumpur election . The alliance was formalised, with the inclusion of Malayan Indian Congress (MIC) in 1954. Their landslide victory in the 1955 Federal Elections (51 out of 52 seats) helped convinced the British that the state was in firm hands, and paved the way towards the nation’s independence in 1957. 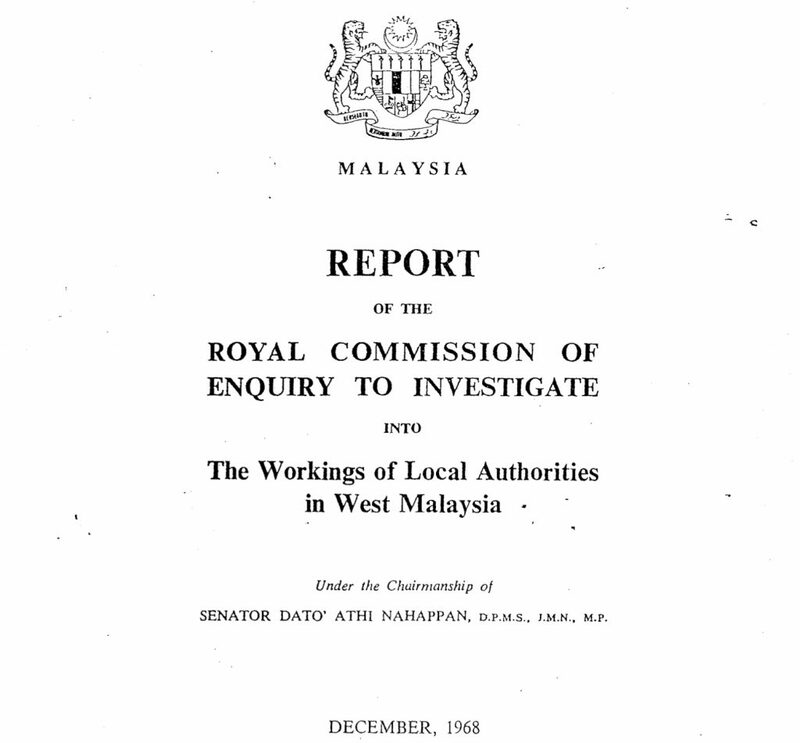 At the same time, the Royal Commission of Enquiry on Local Authorities was set up by the federal government in June 1965, headed by the former Senator Athi Nahappan, to study the workings of local authorities in Malaysia. Subsequently, a report was produced in 1968 and published in 1970. It called upon the government to reaffirm the principle of having elected representatives in local government. However, the suspension remained in force even after the return of peaceful relations between Indonesia and Malaysia. Local elections were officially abolished and replaced by a system of appointed local councillors in 1976. Konfrontasi was blamed for the suspension of local elections in 1965, but in 1964 there was a peaceful general election of much greater complexity and magnitude than local elections, held during the height of Konfrontasi. Also, even before the general suspension of 1965, individual councils had been taken over by state governments. Thus, the justification for suspending local elections was at best incomplete and at worst, disingenuous. The Alliance’s poor performance in local elections was probably the main reason why local elections were suspended. At the national level, Malaya’s 2nd General Election in 1959 was a major shock to the Alliance, especially after its overwhelming victory of 1955. In 1959, the Alliance only garnered 51.5% of the popular vote (down 30.2% from 1955) and lost 30 seats after only losing one in 1955. Most surprisingly, it lost control in Terengganu and Kelantan at the state level. At the local level, state capitals such as Penang and Ipoh were constantly under the control of opposition parties and the Alliance even suffered a humiliating defeat when it lost all eight of the seats it contested in municipal elections in Penang at 1956. Popular support for the Alliance was on the wane across the country, and local councils controlled by the opposition provided local training grounds for opposition politicians, while hindering the Alliance’s ability to implement their policies with minimal opposition and consolidate their support. Against this backdrop of diminishing support, the federal capital, Kuala Lumpur, was the first to have its local elections suspended and placed under direct control of the federal government by the passage of The Federal Capital Act, 1960. The Act effectively put an end to local elections in Kuala Lumpur and replaced the elected council with an appointed commissioner and advisory board. This was perceived as the federal government’s first attempt to cripple the autonomy of local government. Other city councils such as Seremban, Georgetown, Malacca, Johor Bahru, and Batu Pahat soon followed, with the state assuming control over the cities’ local government. Penang Town Hall, build in the 1880s to house the Municipal Commission of George Town. The federal government alleged corrupt practices and mismanagement to justify taking control of local government and suspending elections. These were the official reasons given in the takeover of the local town councils of Seremban, Johor Bahru, Georgetown, and Malacca. In the case of Seremban, the Commission of Enquiry for Seremban did find that there had been maladministration and malpractices perpetrated by local councillors. However, the Seremban corruption case was the only officially proven case of local corruption pertaining to the abolition of elective councils. The cases of alleged malpractices of other councils were either inconclusive or not pursued by relevant authorities. It was also argued that local elective councils were inefficient in terms of their provision of local service and financial management. 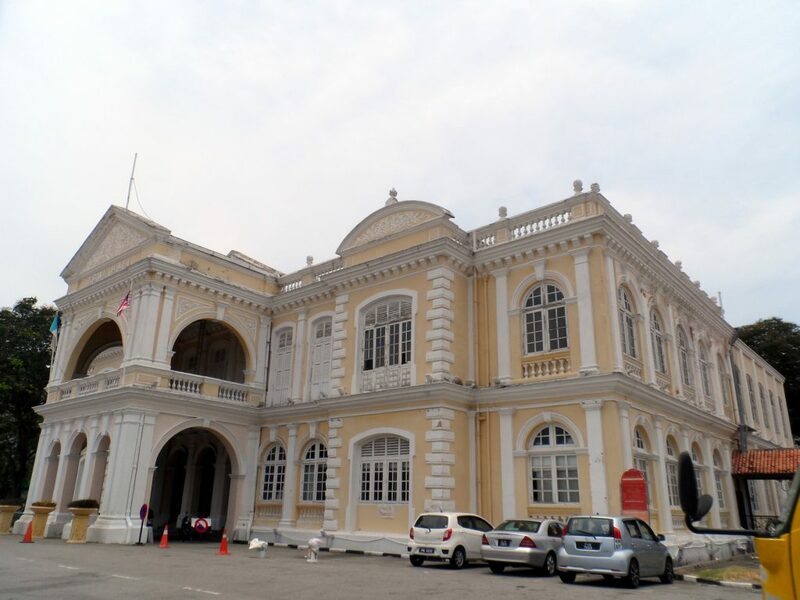 A number of councils, including Malacca Municipality and rural district councils in Penang, Malacca, and Kelantan, were in dire financial situations. However, these were exceptions; what was more common was that local councils and state/federal governments disagreed on policies. For example, conflicts between the council and federal government in George Town (Penang’s capital)—where disputes ranged from the council’s refusal to decorate the city on national day to supplying water to a squatter settlement that the state had condemned and was about to abolish —embarrassed the administration of Penang. The first major project of the Kelantan State Economic Development Corporation was delayed for many months in its own capital by the Kota Bahru city council. Abolishing elective local councils and replacing it with an appointed system was a crude but effective way of liberating federal and state governments from local councils resistant to their vision of national development, regardless of whether local councils genuinely had important or relevant concerns. From these series of events, we could infer that the Alliance had a strong preference for centralisation of power and was sceptical towards local democracy . It seemed that the Alliance at that time was distrustful towards the idea of local elective councils and perceived them as an obstacle towards their control and dominance over a nascent Malaya then. Under the replacement system (which continues to be used today), local government representatives in Malaysia such as Presidents (Yang Dipertua), Mayors (Datuk Bandar), and local councillors (Ahli Majlis) are appointed by the state government. List II of the Ninth Schedule of the Federal Constitution states that the state government has control over the functioning and workings of local government, including local elections. Ideally, an appointment system would lead to higher calibre of councillors as, unlike elected councillors, appointed councillors would be above partisan politics, able to make decisions independent from party politics, and selected from a broader pool of talented individuals that included those not interested in participating in electoral politics. The system in the Federal Capital has brought about complete harmony between the Federal Government and the Municipality of the Federal Capital. This was only possible by the abolition of an elective council and substituting therefore a nominative board. This transformation has effectively introduced a climate of deliberations based on merits of matters. On the other hand, it has eliminated irresponsible and irrelevant electoral promises, party bias in deliberations and decisions in council, opposition for opposition’s sake with little or no regard for the interests of the ratepayers, and other inherent psychological phenomena, e.g. political antics normally associated with party politics in an elected council. Thus, the idea of replacing the elected council with an appointed one was conceived with the design of eliminating partisan politics from the local council—but it did not achieve this purpose. Instead, the system perpetuated a “winner-takes-all” mentality, where the party/coalition that controlled the state government de facto gained the right to appoint all the local councillors in its local government. Hence, the appointment of officials by elected politicians means that local councillors are still heavily influenced by party politics. An instructive comparison might be the system in the USA, where leading government officials are appointed by the elected President. This has not led to non-partisan, non-political appointees. In this way, party politics will always be inextricably linked to a local government regardless of whether it functions with an elective representations or appointment system. Governments have the difficult decisions of distributing resources and picking winners. It is inherently political, whether officials are appointed, elected on a non-party basis, or elected on a party-basis. Rather, a better way of framing the issue is about accountability, transparency, and clarity to citizens and taxpayers. The appointment system obfuscates the lines of accountability of officials. More importantly, it currently lacks a mechanism to compel appointed councillors to be held answerable or accountable to the constituents they are supposed to serve. As they are not elected and are answerable to politicians above them, they have little incentive to make themselves known to their constituents. It’s no surprise that most Malaysians generally have no idea who their local councillors are. As a result of that, the elected Member of Parliament (MP) and State Assemblyman (ADUN) becomes the person that voters approach when they encounter problems in their residential areas such as illegal dumping of rubbish or clogged drains, which are outside their area of responsibility. According to calculations made by the Commonwealth Local Government Forum (a global local government organisation which brings together local authorities, their national associations and the ministries responsible for local government in the member countries of the Commonwealth), the total expenditure by local governments in Malaysia is estimated to be around RM10,687 million in 2017. Local councillors should be held accountable for the local government’s expenditure but the current appointment system with its diminished checks and balances are unable to properly regulate or monitor the spending of the local government. The lack of accountability and transparency within the local government has also given rise to instances of political patronage, whereby the granting of infrastructure projects and business licences is dependent on one’s political affiliations. One recent example is a police report lodged against Mohd Noorhisyam Abdul Karim of Parti Pribumi Bersatu Malaysia (a party of the current governing Pakatan Harapan coalition) accusing him of benefitting from misusing his political connections to secure 80 bazaar lots from Kuala Lumpur City Hall (KLCH). Noorhisyam allegedly secured licenses of 80 bazaar lots from KLCH and subsequently rented them out at exorbitant prices. If there had been local elections in Kuala Lumpur, the procurement process for business licences would be made more accountable, transparent, and subject to scrutiny by the public. The MP of Bukit Bintang, Fong Kui Lun (Democratic Action Party, also part of Pakatan Harapan), admitted that local elections in Kuala Lumpur could have averted the scandal of this nature and provided more accountability and transparency in Kuala Lumpur City Hall. Nahappan’s 1970 report argued that fully (or almost fully) elected local councils played a critical role in connecting Malaysia’s rural villages to the fledgling democratic state in the 1950s. Malaysia’s rural villages and new villages were generally out of administrative reach and vulnerable to the communist insurgency. However, providing them with local councils enabled them to exercise the rights of democracy in managing their civic affairs. Introducing the concept of self-determination through democracy, he argued, enabled villagers to see the “virtue of democracy as a way of corporate life”, building their connection to the broader Malayan nation-state. Therefore, it argued, local democracy had a deep-rooted influence on the early political culture of Malaya, before they were abolished in 1965. What is important to be recorded here is that with the correct mutual appreciation of each other’s roles, powers and duties of two unequal authorities under two different political parties can function side by side with understanding and goodwill. The credit must go to both the Perak State Government and the Municipality of Ipoh. This short chapter of local democracy in Ipoh proves that local elective government in Malaysia can flourish as long as it was given the opportunity and both sides acted in good faith for the benefit of the people. Undoubtedly that there were defects within the functioning of local elective governments in Malaya, but democratic principles should be preserved and prioritised, and systems improved upon rather than discarded instantly at the first sign of trouble. If political partisanship had indeed caused inter-governmental conflicts and encumbered the development of the country, the natural remedy of the situation should be building consensus and/or ameliorating the divisions. If the solution to conflict lies in abolishing elective representations of the lower tier of government, it follows then that state governments which are governed by the opposition should also naturally suffer a similar fate and have its elective representations abolished by the federal government in the future—and indeed, all lower divisions should be replaced by appointed officials. The logical but farcical implications of such conclusions become very clear. Efficiency, though highly desirable in itself, should be made an indivisible part of a democratic process rather than be divorced from it. Democracy with efficiency is always more desirable and better than efficiency without democracy. In the journey towards attaining an efficient democracy, we should not allow the difficult terrain of the journey to discourage or divert us from striving to reach the goal. In recent years, there has been recent talks of reviving local elections, more commonly known as restoring the “third vote” to Malaysians (after federal and state elections as the “first” and “second” votes, respectively). In 2014, the then-opposition-led Penang state government challenged the constitutionality of abolishing local elections. The federal court ultimately ruled against the state government. Since then, there has been a lack of political will and interest from both sides of political aisle to push for the revival of local elections. Nevertheless, there remain grounds to feel optimistic over the prospect of local elections in Malaysia. The historic 14th General Election that led to a change of government for the first time in Malaysia has obviously expanded the scope of reviving local elections. Newly elected member of parliament Maria Chin Abdullah has vowed to call for a Royal Commission of Inquiry on bringing back local elections . On the level of federal government, newly appointed Minister of Housing and Local Government Zuraida Kamaruddin has also promised that there will be a detailed study on the re-implementation of local elections in three years . The history and practice of local elections and local democracy are deeply embedded in Malaya, and it remains to be seen whether there will be a revival of local elections in Malaysia. Democracy in Malaysia took a giant leap forward when the principle of peaceful transition of power through elections was faithfully adhered to. However, the progress of local democracy in Malaysia remains stagnant. Malaysians are still awaiting their long forgotten “third vote” to have a local government that’s by the people, for the people, and of the people.